Why the Model Still Works. Let’s call networking what it actually is: connecting. Strategically, many business owners see networking as strictly a means to generate referrals. One of the benefits of belonging to our chamber is that, unlike many other networking groups, we don’t restrict participation based on gender, industry type or geographical location. 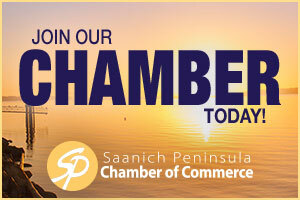 What you will discover when you attend one of our events, is that our members are friendly, interested and most of all, very willing to support another person doing business on the Saanich Peninsula. One of the referral groups I have been asked to promote to our members is Business Networking International (BNI). Being a proud supporter of chambers of commerce for many years, I thought it worthwhile to consider how our two organizations differ. BNI members join with the expectation that their participation in weekly meetings will generate referrals that convert to actual business. So how are we different? First off, chamber membership is much less expensive and our benefits go well beyond referrals. Your membership payments support initiatives that exclusively benefit our community. We are continually evolving to increase the value to members. Did you know that we certify documents for goods being exported? 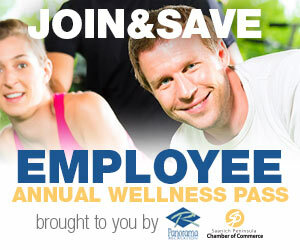 Or that we offer a discounted Panorama Employee Wellness Pass for small businesses? Even as a solo entrepreneur, our Chambers of Commerce group insurance plan has coverage options. Do you or one of your employees wear glasses or contacts? We have a member discount for that too. Soon we will be offering discounted home insurance. All this and more, including networking and the opportunity to expand your client list, is available to you through chamber membership. I will leave you with this recent evaluation from one of our members, who, because he had not actively participated in any of our events concluded that he was not getting benefit from his membership and had decided not to renew. Then he asked his new customers how they had heard about him and discovered that they had learned about his business from our online Member Directory. Not surprisingly, he renewed. Like this member, you may not fully appreciate the ways in which your membership is working for you, but it always is. Voltaire said, “I might disagree with your opinion, but I am willing to give my life for your right to express it.” I have a slight disagreement with Voltaire. I am willing to give my life for your right to hold an opinion if it is based in relevant expertise but even then, I do not agree that you have a right or an obligation to express it. We have many opinions. In fact, we express our opinions on a variety of subjects every day just by the choices we make: the car we drive, the clothes we wear, the food we eat. These, and many others of our opinions have been formed by our life experiences, world views, and often, our privileges. There are various levels of opinions – the most legitimate being those grounded in science and expertise. Then there are those that are based on our politics and ideas of what others should do and finally there are those that include our personal experiences, likes and dislikes. One’s subjective beliefs are more difficult to defend. The saying “everyone is entitled to their opinion” only means that we can think whatever we like but our opinion is not more deserving of respect than anyone else’s and we are under no obligation to express it. And yet, people do. Opinions are voiced every day in letters to the editor, as comments online, and in other public fora. Often these opinions are trotted out like facts and are garnished with condescension, sarcasm, and cynicism. Many opinions are not facts; rather they are judgments and assessments and are masquerading as passive-aggressive advice. Opinions can be wrong and ill-conceived and that they are widely held and shared does not make them valid. The quality of public and personal engagement would be elevated if we considered the following when our opinions are burning to be shared: Do I have the information and actual expertise to form an opinion? Why do I believe my opinion ought to be shared? Am I sharing it with the right people? Have they asked for my opinion? Will the sharing of or my delivery of my opinion diminish other people’s willingness or opportunity to communicate their opinions? It is important that our privilege and fundamentalist beliefs don’t give us the false idea that our opinions are more significant than anyone else’s. Listen to opinions that differ from your own – especially those based in expertise. Leave room for others to influence discussions. There is wisdom in knowing what you don’t know. Superiority is illusory.